A deep ruby beer with chocolate, caramel, and sweet tobacco in the aroma. The taste is tangy and gently bitter, with bitter chocolate, licorice, and coffee notes, followed by a dry, bitter, and nutty finish, with roasted grain coming to the fore. I am getting sick of these dark beers! You’re right, no I’m not. I love these dark beers. The darker the better, I always say. 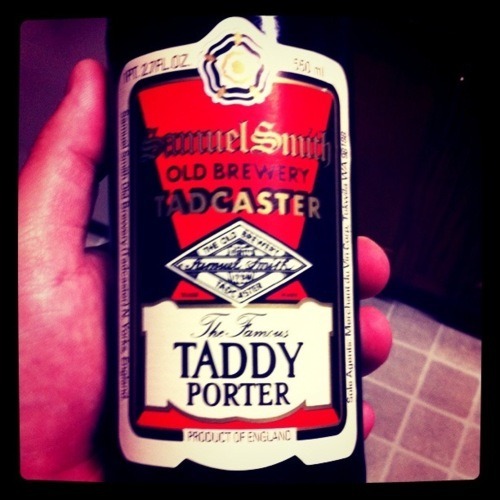 Tonight we are drinking a Samuel Smith’s Taddy Porter. I have had this beer many times before. I usually buy this beer when I don’t want to spend a ton of money on a bottle of something that I know is not only imported, but is also delicious. The first few times I had a Samuel Smith’s I wasn’t too impressed. I am not really knocked out of my socks here either, but it’s a good quality beer. The Taddy Porter is actually the furthest thing from a porter in my opinion. It’s WAY too thin, and has a short aftertaste. I think this beer will taste better the warmer it gets, but these are always sold ice cold. The beer smells almost as good as it tastes. I don’t want to seem like I am ripping on Samuel Smith’s, but I feel like every time I try their beers I am disappointed. I don’t know… I just can’t fall in love with this beer. Don’t get me wrong, it’s good. But it’s not great. Nothing to brag about. It has a pretty cool story, regardless. This beer reminds me a lot of the one we had last night. Of course, they are both dark beers – they look very much alike. Dark, almost black, with not much head and very thick in the glass. They almost look like soda. This one, however, has a bit more smell to it. It smells very rich and kind of nutty. Let’s take a drink. We get a very strong, chocolate and coffee taste, like a lot of porters. It tastes good going down, but then you get hit with the aftertaste. I have a really hard time not comparing this to last night’s beer, honestly. And I think last night’s just had a smoother taste. This one is good, but I don’t care as much for how long the aftertaste lasts, especially since it’s just not as good of an aftertaste to me. But I do like the beer. Even though it wouldn’t be at the top of my list to buy again, I would purchase it at least one more time. Maui Brewing Company: Brewed With Aloha!